In 1763, Ottawa Indian war leader Pontiac, successfully united many of the tribes in the Ohio Country. His goal was to drive all English settlers, traders, and soldiers from the Ohio Country. 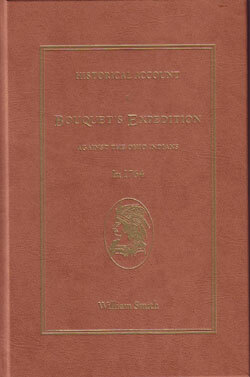 Colonel Henry Bouquet was chosen to lead an expedition into the Ohio country to put down this Indian uprising, later to be called Pontiac's Rebellion, and the history of this expedition is detailed in this book, originally published in 1868. This history covers from the beginning of Pontiac's Rebellion with the capture of Fort Sandusky to the conclusion of peace and the return of captives in late 1764. With preface by Francis Parkman, this new hardcover edition of this classic book includes a two-page map, 5 special Appendices (Appendix I: Construction of Forts, Appendix II: French Forts Ceded to Great Britain, Appendix III: Route from Philadelphia to Fort Pitt, Appendix IV: Indian Towns on the Ohio River and Appendix V: Indian Nations of North America) and a translation of Dumas’ Biographical Sketch of Gen. Bouquet. Excerpted from Lowdermilk's original book entitled History of Cumberland, Maryland, this volume begins with the early history of the region in the 1700s. The earliest written and oral history of the indigenous people begins in 1728 at the Indian town of Caiuctucuc, located at the junction of two streams known as the Cohongaronta and Caitucuc. The town was built on ground near what would later become Cumberland, Maryland and the inhabitants of the region were a branch of the Shawnee tribe. The first official government venture into this region and westward into the Pennsylvania frontier came at the request of Governor Dinwiddie to reconnoiter French intentions and activity in the region in the early 1750s. To carry out this order, a young George Washington was chosen and his winter journey into Western Pennsylvania would culminate with his capitulation at Fort Necessity in 1754. Washington's Journal of this expedition forms an important part of this volume. The remainder of the book covers the building of Fort Cumberland and the activities that led up to the disastrous defeat of General Braddock in 1755. Braddock's Orderly Books from February through June 1755, taken from originals in the Library of Congress, are also included. The causes of the Braddock expedition's disastrous defeat is one of the great mysteries of colonial American history. Was it caused by poor performance of the British enlisted soldiers? Was it caused by British infantry tactics, particularly platoon volley firing at French and Indians hidden behind dense foliage? Was it poor strategic decision-making by Braddock? Or Braddock's stubborn refusal to listen to practical advice from lowly woodsmen and Indians? This beautifully-produced volume, providing a wealth of answers to these questions, is the definitive history of the ill-fated Braddock campaign against Fort DuQuesne at the beginning of the French and Indian War. Originally compiled in 1855 and often cited as the best account of the Braddock disaster, the volume draws heavily on primary source documents. The book is primarily made up of two major documents: Captain Orme's Journal and The Morris Journal. Supporting documents and appendices include: Braddock's Instructions, Fanny Braddock, George Croghan's Statement, French Reports of the Battle, Verses on Braddock, and Braddock's Last Night in London. The book also features 4 double-sided, full-color maps; 2 black & white double-sided foldouts, and an index. This volume chronicles the phenomenal rise of the Iroquois Confederacy during the "Beaver Wars" of the 17th century. In what were perhaps the greatest series of military victories in Native American history, the Five Nations of the Iroquois (the Mohawks, Oneidas, Onondagas, Cayugas, and Senecas) defeated, destroyed, and absorbed enemy tribes stretching over a vast area from eastern Canada to Virginia to Illinois--forever changing the cultural map of eastern North America. During this period, the Iroquois emerged as a dominant force that was both respected and dreaded by neighboring tribes and the European colonial powers alike. This volume gives particular attention to the wars between the Iroquois and the Hurons, Algonquins, Montagnais, and French that climaxed in total victory for the Iroquois in 1650. The accounts included in this volume cover the underpinnings of the wars and the battles, raids, and skirmishes up to and including the collapse of the Hurons. Compiled from contemporary accounts found in the Jesuit Relations, the writings of Cartier, Champlain, and Sagard, the extracts also describe the evolution of fighting techniques among the eastern woodland tribes, strategy and tactics, the treatment of war captives, the influence of European trade, war rituals, and peace negotiations. Compiled and Edited by Claudio R. Salvucci & Anthony P. Schiavo, Jr.
Iroquois Wars II continues the chronicle of the rise of the Iroquois Confederacy during the “Beaver Wars” of the 17th century, using primary source extracts from the Jesuit Relations. The accounts included in this volume cover the incredible series of victories won by the Iroquois over neighboring tribes following the defeat and collapse of their Huron enemies in 1650. Iroquois war parties fought wide-ranging campaigns against enemy tribes and Europeans alike in practically every state east of the Mississippi. In doing so, they destroyed or displaced dozens of tribes, many of which are known to history by their names alone. Extracts covering the stunning defeat of the Neutral confederacy in the 1650s and of the long war with the Susquehannocks (Andaste) are prominently featured. Several detailed extracts covering the dramatic war between the Iroquois and the Eries are also included, along with numerous accounts of the French invasions of Iroquoia in the 1660s and attempts to forge a lasting peace. An introduction helps place the extracts in their historical context and provides a list of further reading material. Each extract is properly cited for easy referencing within the Jesuit Relations, allowing the book to be used as a companion to the Relations or as a stand-alone reference. Six original campaign maps are provided, as well as three helpful appendices: a detailed chronology of events from 1650–1675; a synonymy of obscure tribal names contained in the volume; and nearly 50 brief biographies of individuals (French governors, native chiefs, and missionaries) mentioned prominently in the extracts. Originally published in 1929 and revised in 1931, Indian Wars is based primarily on documents found in the Pennsylvania Archives and Colonial Records. This collection of military encounters involving the Indians on the Eastern Frontier includes, among others, accounts from the French and Indian War, Lord Dunmore’s War, Pontiac’s War, and the Revolutionary War. This reprint was made from one of Sipe’s personal copies, complete with handwritten corrections in the margins and includes the 156 page supplement added to the 1931 edition. This supplemental material features a chronological listing of all major Indian events on the Eastern Frontier; a listing of all officers of the early Commonwealth of Pennsylvania; a listing of Indian names of Pennsylvania and their meaning; and details of Sullivan’s campaign against the Indians. As a result of the Indian campaigns against the Americans during the Revolutionary War, interesting and unusual Indian captivity stories abound. These two noteworthy narratives, epitomize the struggle between Indians and American settlers on the early frontier. The first involves Horatio Jones, a young soldier who was captured by the Senecas in Bedford County in south-central Pennsylvania. Hale was adopted by the Senecas, took a Seneca wife, and eventually became a chief who took part in tribal councils and negotiations with the U.S. government. The second captivity narrative involves 12 members of the Gilbert family who were captured in 1780. The family endured 2 1/2 years of captivity before being released. Both of these narratives contain a wealth of information about Indian life in the late-18th century. During the course of the French & Indian War years, thousands of pounds sterling were expended by both the French and the British in their efforts to buy Indian friendship and loyalty through gift-giving. This was high-stakes diplomacy with the fates of two competing empires hanging in the balance. It was also a war for profit in which the Indians were pawns to be bought by whatever means were necessary to effect the outcome. Indeed, these diplomatic missions and this showering of gifts helped decide the war. The details of these transactions along with their hoped for results are magnificently detailed in this book and come with complete referencing and documentation. With Indian raids and the on-going French and Indian War threatening its western borders, Pennyslvania's pacifist, Quaker-controlled government was slow to react. However, with complaints from frontier settlers reaching a crescendo, Pennsylvania unwillingly began a program of fortification along its frontier. By 1756, more than dozen forts garrisoned by Pennsylvania troops marked for the first time a boundary between frontier settlements and a hostile wilderness. This book covers not only the forts built by Pennsylvania, but also those built by the French, the Ohio Company, Viginia, and later the British on Pennsylvania soil during this time of conflict and uncertainty. Each fort is allotted a separate section, and where necessary the account is carried beyond the year 1758 to round out the story.